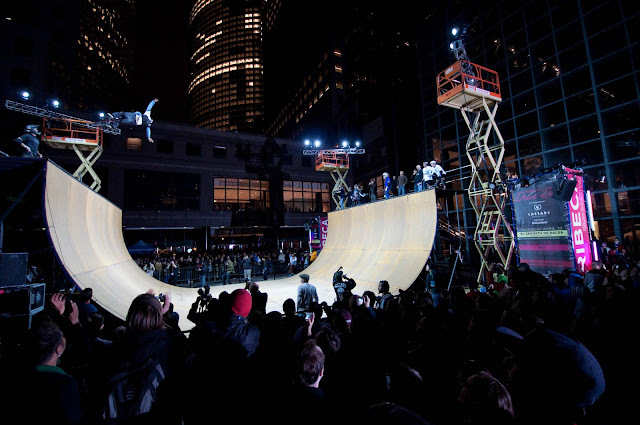 Tribeca Drive In--"The Birth of Big Air"
A great documentary on Matt Hoffman closed out this year's Tribeca Film Festival "Drive In": The Birth of Big Air. 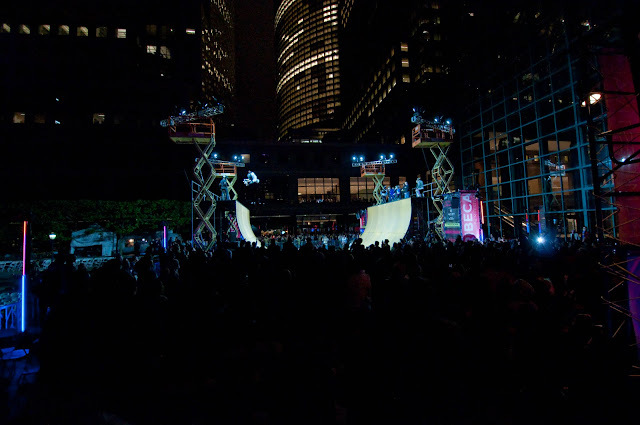 The movie was great, and the excellent team at Good Sense & Company (for whom I work on these events) came up with a great show-stopping closer: a live performance by Hoffman and others on a half pipe built overnight Friday on the plaza of the World Financial Center. This presented a special challenge for me with the sound system, since [note: technical geekery ahead, skip to the pictures if you're bored!] I designed the entire system to support the images on the screen, and, in this difficult acoustic environment, that means more than a dozen speaker positions precisely delayed back to the Meyer MILO arrays behind the perforated film screen with SMAART V7. The emcee's for the half pipe show were going to be on top of the ramp, which was roughly 275' away from the screen (you can see the distant screen in the photo above). If we had used the regular system, the emcee's would have been washed in a brutal 1/4 second "echo" caused by the late arrival of sound from the screen. So, we repurposed some of the speakers to cover the areas behind the ramp (normally, during the film, we keep those areas quiet to minimize echo problems off the massive buildings) and added a number of additional speakers (this is an all -Meyer Sound show) on the scaffold towers around the ramp. I then retimed all the speakers out to make the "zero point" the top of the skateboard ramp, and saved that as a new preset. 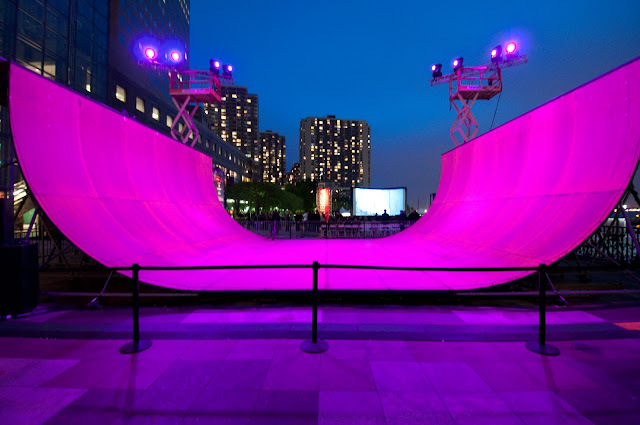 At the end of the film, the credits rolled and the director came out on stage (by the screen) to introduce Hoffman, and then "threw" the show to the half pipe. As he did that, we rolled the music and I called up the modified system preset for the ramp on the Meyer Galileo's. This took about 5 seconds and was well worth it (and was my first ever system delay "cue"). 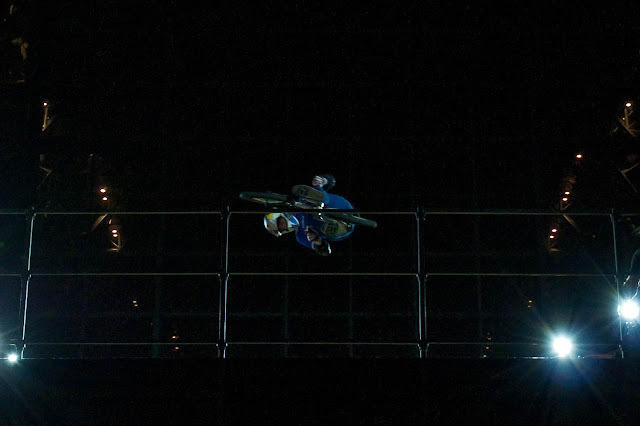 More photos here, and a write up of Friday night here.